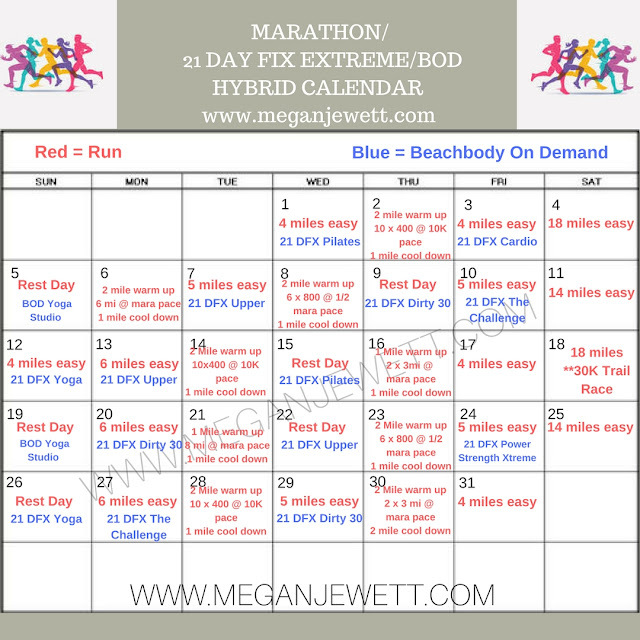 Marathon Training Month with Beachbody! This plan is born out of frustration. Frustration that what used to work for me no longer works. 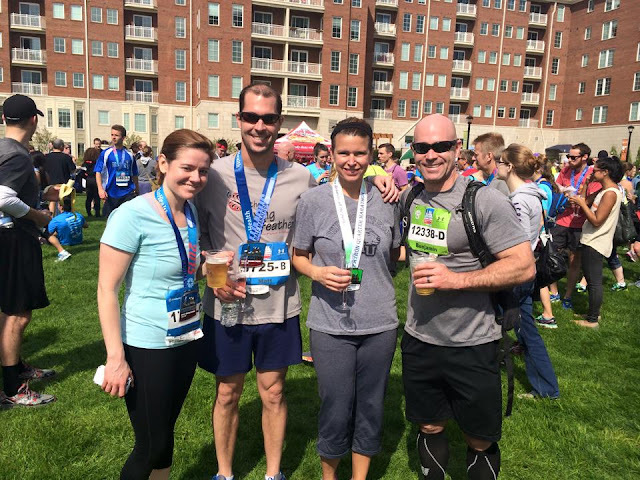 If you've followed any of my story, you might know that in 2015, I ran my 14th marathon. I was also at one of my heaviest weights ever. 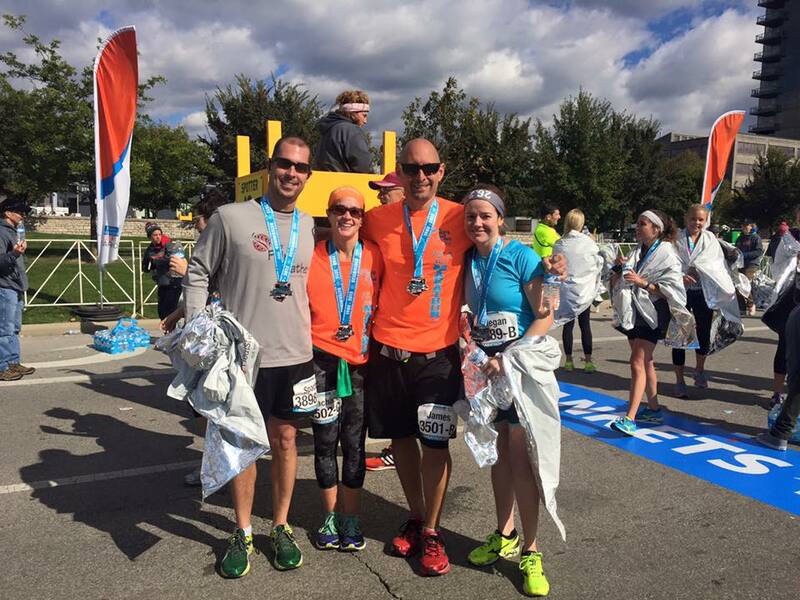 You might be thinking..."how is it possible to train and run a marathon and be heavy?" Guess what--if you aren't paying attention to what you eat, and if you aren't pushing yourself to actually make gains with your running and incorporating strength and cross training (mixed with a dash of getting older hormone changes), then you might be able to finish a marathon, but it's not going to give you the kind of body changes you want. So, enter 2016. I started cross training, lost almost 20 pounds, and now I'm training like a beast for a spring 2017 marathon! It will be #15 for me and I hope it's a fast one. Below is a sample of one month of my marathon training program. It is not a beginner marathon training plan--I would consider it intermediate to advanced. It is adapted from the Level Two Boston Marathon Training Program. I have incorporated workouts from Beachbody On Demand--mostly the 21 Day Fix Extreme because I find those super-effective, 30 minute workouts to be a nice compliment to the running. They fly by and help me build all-around strength. --You can do this to maintain by using past paces for each of the distances listed. If you don't know a particular pace, you can calculate it here. You can also use these paces aspirationally, meaning, you try to hit what you need in order to run a particular race pace. For example, my marathon goal is to run it in less than 3 hours, 40 minutes. That's my goal--I hope it's a little faster, but I've been around the block enough times to know that sometimes races don't go your way. Sometimes you have a terrible run. Sometimes something external is off like the weather or bad crowd placement. Sometimes you don't train right for the conditions--like the course is extra hilly and you aren't prepared. But, barring those circumstances, my goal is sub 3:40. So when the plan says to run 10 x 400 at 10 K pace, you can do this on a track or a treadmill. 400 meters is 1/4 or .25 of a mile. At 10 K pace, I want to be running each of these at 7:30 to 7:10 pace. The link to the Boston Plan has the times laid out for you. Training plans are very personal things. I also sometimes switch days and video workouts depending on the weather, my fatigue level for the day, if I have running buddies to go with, etc. I can eat whatever I want." Yeah--I guess you can always eat whatever you want. But I'm choosing this time to eat so that I can have great runs. I eat so that I stay healthy and don't get injured or easily fatigued. I eat so that I can live a long, healthy, vital life. But it's 80/20 so working out like this gives me room for lots of clean foods plus the occasional treat! If you want to learn more, get in touch by sending me an email at megan9j@gmail.com. If you want to get these workouts and some superior nutrition to fuel these workouts--send me a message or make me your free coach HERE! I offer personalized coaching and training plans (did I mention that I'm an ACSM Certified Personal Trainer? ), accountability groups to help get you to the finish line, and meal planning help and guidance. So whether your goal is to run a marathon, a 50K, or a 5K--Or just knock out 30 minute workouts everyday and FINALLY see RESULTS! I'm here--ready to help.